The idea of going to court to give evidence may seem daunting. Knowing what to expect will make the experience less of an ordeal. Any paperwork received should be read carefully – in particular the date and location of the trial should be checked and re-checked. Witnesses should make sure they know where the court is and how to get there. The Witness Service can arrange for witnesses to have a look around the court before the day of the trial. Alternatively, most trials are open to the public so anyone can go to their local Crown Court to watch a trial. Witnesses who have special requirements – for example those who need an interpreter or who have a disability – should contact the Witness Service prior to the trial. The Witness Service will make any necessary arrangements to ensure that witnesses are as comfortable as possible. As soon as they arrive at court witnesses should sign in for their case. Notices will tell visitors to the court where they need to go. If in any doubt, ask a receptionist, usher or security guard who will be able to point people in the right direction. Witnesses should be able to have a look at their witness statements before they give evidence. A trial will often take place a long time after the statement was given and memories may have faded in the meantime. Predicting exactly how long a trial will take or when a particular witness will be needed is not always easy. Witnesses may find that they have to wait around for some time before they are called into court. Witnesses should not talk to anyone about their evidence until the trial has ended. When the court is ready for a particular witness they will be called into the courtroom and the usher will lead them to the witness box. Before a witness begins to give their evidence the usher will ask them to swear to tell the truth. 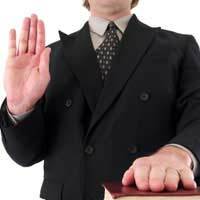 If a witness has a religion they take an oath on the holy book applicable to that religion. The usher will help locate the correct book and give the witness a card which has on it the words they have to say. Those who do not have a religion will affirm. In either event once a witness has been “sworn in” they are on oath and anything they say must be the truth. Lying on oath can be a very serious crime. Once a witness has been sworn in they are ready to give evidence. A barrister or solicitor representing the party who has called the witness will begin to ask some questions. The purpose of the questions is to get the same information from the witness as they gave in their witness statement. This is known as evidence-in-chief. Listen carefully to all questions. Make sure questions are understood before answering; only answer the question that has actually been asked. If a witness does not understand a question, cannot remember or does not know the answer they are entitled to say so. Although a lawyer will be asking the questions witnesses should address their answers to the judge. Keep calm and do not argue with the lawyer. When a witness has finished giving his evidence, the lawyer for the other side is entitled to cross -examine that witness. The purpose of cross-examination is to cast doubt on the witness’s evidence. This is the lawyer’s job – it is not a personal attack on the witness. The lawyer can, and will, ask leading questions. Witnesses should not allow themselves to be swayed or bullied into changing their stories from what they know to be true. Once a witness has been cross-examined the first lawyer may ask a few more questions to clarify anything that was said during cross-examination. Occasionally the judge may also ask a few questions. Threatening or attempting to influence a witness is a very serious, criminal matter. If a witness, or their family, is threatened or intimidated because of their role in a trial they should immediately approach the Witness Service, a member of the Crown Prosecution Service or the police. In extreme cases people may be placed in a witness protection programme. Without witnesses many criminals would never be convicted. Courts can be intimidating places and witnesses can sometimes feel as if it is they who are on trial. Anyone who acts as a witness should bear in mind the vital role they play in the administration of justice. I have lived in a block of flats for over twenty years. Aproximatly five years ago a new owner moved into the complex. This person has intimidated, made threats of violence and bullied people not only physically but psychologically. Some have moved out. When I was on speaking terms with him, he informed me that if anyone crossed him, he would punture the tyres of their car,and stated that nobody could prove it was him. He also said he could get other people to come around and attack the person he fell out with. This has escalated to the point of him shouting abuse from his window at me this morning. I ended up telephoning the police and they have spoken to him with regards to his actions. They know full well that unless there are witnesses they cannot do any thing to stop this behaviour. The car park is situated so that I cannot get any cctv to monitor my car and am concerned that I will be having damage done to my car. Other than selling up ( I can't afford to move and am trapped where I live ) I do not know what to do. Can you assist me with this matter? I have a very important question could you be able to help me please.it is a test i must complete, but i do not know how to put it in a right sentence.it is kind of a role play which i'm suppose to provide in court as to the demeanor of the offender the story goes like this.At 0900 on monday 12 july 2010, a male student John,(25old) commences the same course as you.throughout the morning,the student john becomes very arguementive with the lecturer and he commences to swear at the lecturer and some student's who have taken hi to task over his behaviour. At about 11.05am,the lecturer tells john that his behaviour is unacceptable and he is told that he must leave the course.john again swears at the lecturer and several students before he picks up his belonging and commences to leave the room.on the way out of the room ,john continues to swear loudlyand he kicks over several empty chairs in the room before walking out the door,which he slams shut behind him.He then proceeds to the stairs which lead to the ground floor.You and the other students, walk to the top of the stairs as john walk across the foyer towards the front glass door,a distance of about 6 metres.The front door of the building is recessed about 2 metres from the foothpath.You observe him open and pass through the door and proceed to walk across the brick tiled entrance area towards the footpath. on reaching the foothpath you observe john stop for several seconds before you see him turn and walk back towards the front door entrance to the building.you then see john kick the door with his foot and you see the glass shatter. The lecturer and several students including you go immediately to the entrance area where john is arrested and restrained.Some 10 minutes later,Police(who have been called)arrive and take john away.He is subsequently charged with the offence of Malicious Damage.the question is how would his DEMEANOR CHANGE.how do i make a( Detailed Statement)relating to the arrest of the offender,as to the offender pleads NOT GUILTY to the charge of MALICIOUS DAMAGE.Please guide me waiting for your Responce.